Join Meredith Cameron and Jamie Deluccio in New Mexico for a long weekend of hot springs, yoga, and healing. This long weekend is meant to bring you HOME, to your true self. Only 10 people for this luxurious weekend. A unique resort destination in Northern New Mexico, has been a gathering place, healing mind, body, and spirit naturally for centuries. Come retreat to our secluded refuge. Relax with a massage and their signature Milagro Wrap, and rejuvenate in our legendary waters. Pueblo modern details such as reclaimed barn wood throughout and private outdoor patios that border the stunning cliffs near the Springs. Each patio comes with a private Posi pool and hammock to retreat and relax during your stay. 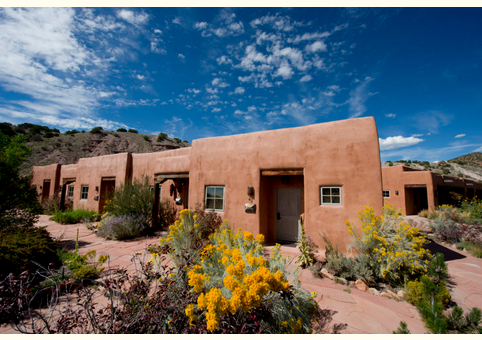 The enchanting Pueblo Suites overlook a beautiful courtyard & are designed with traditional New Mexican furnishings. Dinner from 7p onwards. We will not eat as an entire group because we want everyone to nourish their own desire to rest, use the hot springs and eat when they want. If you are flying, Albuquerque airport is 2 hours from the venue. Car rental is needed if you are flying. We also suggest to stop in Sante Fe and absorb it’s magic (1 hour from the venue). If driving from home, please let us know and we will send you directions.